There’s an undeniably strong bond between humans and dogs. They’re family to each other, best friends of one another, and almost nothing can break them apart. But ever since the Great East Japan Earthquake Disaster that occurred on March 11, 2011, many dogs were left abandoned or lost from their homes. On March 10, the Japanese Canadian Culture Centre will be screening Dogs Without Names directed by Akane Yamada. 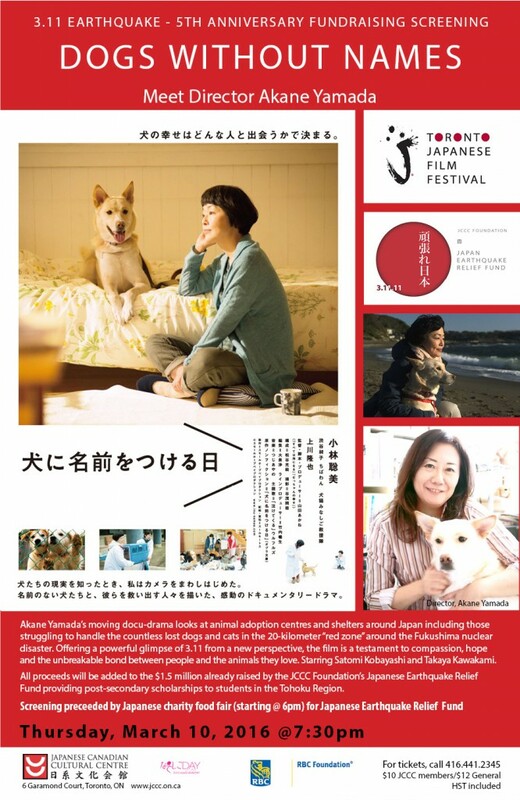 Starring Satomi Kobayashi (Kamome Shokudo, Megane, Pale Moon) and Takaya Kawakami, this documentary-drama looks at the issues and struggles with animal adoption centres and shelters around Japan. This is a heart-breaking, compassionate story filled with hope and affection for the animals that they love. Synopsis: Akane Yamada’s moving docu-drama looks at animal adoption centres and shelters around Japan including those struggling to handle the countless lost dogs and cats in the 20-kilometre “red zone” around the Fukushima nuclear disaster. Offering a powerful glimpse of 3.11 from a new perspective, the film is a testament to compassion, hope and the unbreakable bond between people and the animals they love. There will be a Q&A session with Director Akane Yamada after the movie. All proceeds will go towards the $1.5 million already raised by the JCCC Foundation’s Earthquake Relief Fund supporting post-secondary students scholarships in the Tohoku Region. Visit the JCCC website for more information!